For severely dry skin prone to itching and atopic dermatitis or eczema. Fragrance-free, preservative-free, paraben-free, alcohol-free, hypoallergenic, non-comedogenic. After cleansing with XeraCalm A.D Lipid-Replenishing Cleansing Oil, apply 1-2 times daily to dry areas of the face and/or body. Not recommended for use on broken skin. 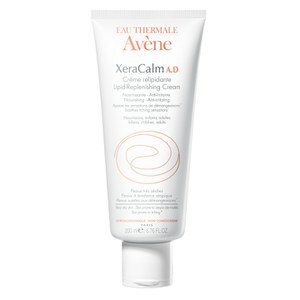 Avene Thermale Spring Water (Avene Aqua), Mineral Oil (Paraffinum Liquidum), Glycerin, Caprylic/Capric Triglyceride, PEG-12, Oenothera Biennis (Evening Primrose) Oil (Oenothera Biennis Oil), Glyceryl Stearate, Myreth-3 Myristate, PEG-100 Stereate, Polyacrylate-13, Aquaphilus Dolomiae Extract, Arginine, Citric Acid, Evening Primrose Oil/Palm Oil Aminopropanediol Esters, Glycine, Polyisobutene, Polysorbate 20, Sodium Acetate, Sorbitan Isostearate, Tocopherol, Water (Aqua). Please Note: This product can only be shipped within the US. Discount has been applied to the MSRP. Offer valid for a limited time only.